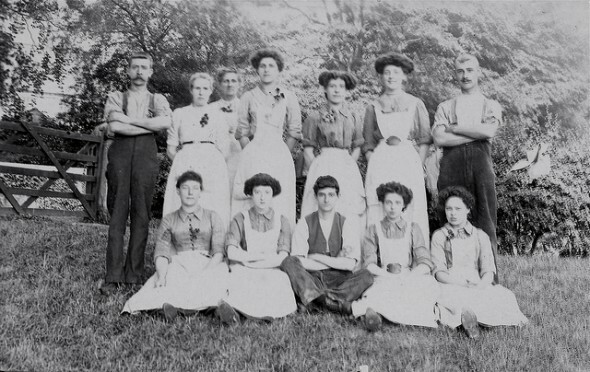 I can’t believe I’ve never written a post about servants on this website, but since there are so many other websites and books out there who’ve covered the subject in much more detail (and possibly better than I will), this post is a quick and dirty rundown of the who, how, where, and why of Domestic Servants in Edwardian England. Such a large staff was not typical amongst all great country houses, but the scope and scale of the house, not to mention the entertainments and house parties and fetes held on the estate, required a large staff of mostly invisible employees to keep everything humming along. Outside staff usually comprised of coachmen, grooms, stable boys, gardeners, gamekeepers, and later the chauffeur/mechanic. Some households even hired their own dairymaids, who churned the butter, milked the cows (though some localities employed cowkeepers for this task), watched the cheeses, and made the cream. If there were no chef (usually male, always French), there was a cook (a woman, always British), who unfortunately was usually paid much less than her male counterpart. Included in the wages of domestic servants were allowances for beer, sugar, and tea, and they given annual gifts of cloth with which to make up their uniforms. About £1,000 a year—A cook, upper housemaid, nursemaid, under housemaid, and a man servant. About £750 a year—A cook, housemaid, nursemaid, and footboy. About £500 a year—A cook, housemaid, and nursemaid. About £300 a year—A maid-of-all-work and nursemaid. About £200 or £150 a year—A maid-of-all-work (and girl occasionally). By the mid-Edwardian era, legislation was introduced to protect the rights of domestic servants, and Lucy Maynard Salmon’s 1901 publication, Domestic Service, covers these legal, social, and employment aspects of domestic servants in both Europe and America. Though WWI did not break the tradition or need for servants, post-war housewives had long been admonished by women’s journals and newspapers and books about self-sufficiency, and the invention of household appliances gradually chipped away at the dependence on servants. Nevertheless, the character of the country house, or even the London mansion, was largely created by its large staff, and being “In Service” was considered a coveted position for the lower classes for a surprisingly long period in history. I agree that these were coveted positions for the lower classes for a surprisingly long period in history, but I assume that was because of the steadiness and long term nature of the employment. Not because the staff were paid brilliantly or because their working conditions were easy. What would happen to the job if a young man or woman wanted to marry? @Hels It was very rare for servants to remain in their posts if they married. Lord Grantham was a generous man to extent a cottage to Bates and Anna after they wed, because most servants had to quit (and since the housekeeper and mistress of the house kept such a close eye on the maids, it was almost an offense that they were able to meet someone long enough to get to that point!). I am a first time visitor and I am in love with the place. Such original and interesting content.